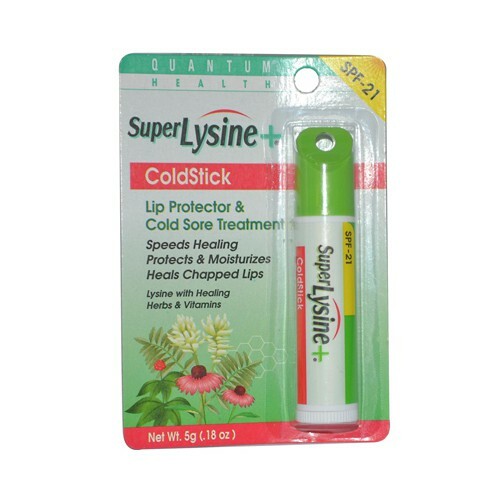 Quantum Super Lysine and Cold Stick Tube Lip Protector and Cold Sore Treatment Description: Sun Block, Lip Protector and Cold Sore Treatment Speeds Healing, Protects and Moisturizes, Heals Chapped Lips Super Lysine Coldstick, with its healing herbs, vitamins and SPF 21 sun block, provides fast, soothing relief without burning numbing or drying your lips. Be sure to try Super Lysine + ointment and tablets. Disclaimer These statements have not been evaluated by the FDA. These products are not intended to diagnose, treat, cure, or prevent any disease.